Upgrading from ClipMate 5 to 7 is tricky because these two programs use completely different database storage. ClipMate5 stores its data in a series of "flat files and directories", where ClipMate 7 (and 6) use a relational database. While ClipMate 6 had a function for importing v5 data, it was bulky and contained a lot of old code, so we discarded it in version 7. 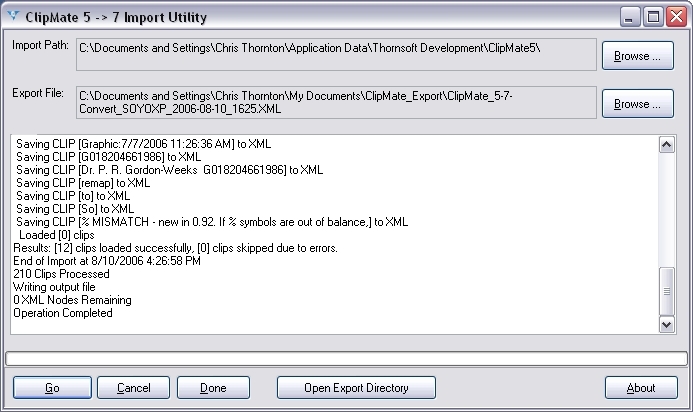 Rather than port that code into version 7, we are relying on the XML Import capability in ClipMate 7.1 to do the job. There is now a stand-alone conversion utility that will read a ClipMate5 data directory and produce XML that is compatible with ClipMate 7. This utility contains the old code from ClipMate5, and the sleek new XML routines from version 7.1 (and later). Click HERE to Download the ZIP file, unzip with your favorite unzipper such as WinZip, and run the resulting Convert5XML.exe file. You can run it right from the zip, or extract it somewhere. There isn't a formal installer, as it's a "single-use" sort of thing, with no additional files. Be sure NOT to drill down into the directory. You want to use the directory that contains your collections, but you don't want to be IN a collection. So if you see sub-folders such as "long-term" and "short-term", stop right there, and don't dig deeper. That's right where you want to be. Results:  clips loaded successfully,  clips skipped due to errors. Now you can click the "Open Export Directory" button for easy access to the new file, in case you need to move it to another machine, or verify that you know where it went. Using ClipMate 7.1 or later, use File | Import Clips From XML. Select the file that you created in step 4. Your new clips should now be merged into your current ClipMate 7 database. After you verify that the data is safely migrated into the ClipMate7 database, you can delete the conversion utility (just delete it, there's no uninstaller) and you can also remove the ClipMate5 data directory. You may wish to save the XML file for archival purposes. If you do, you may wish to ZIP it to save space. 7) Save $10 when you register! ClipMate 5 users can save $10 by using the ordering link found on this page.